5:50–The Historic US Route 20 Association is asking tourists to take and share pictures in each Iowa community on the route for the chance to win prizes. JayJay Goodvin tells Tim Harwood about the promotion. 6:35–The owners of a major manufacturer of opioids are facing scrutiny over their financial transactions. Fox News Radio Legal Analyst Loretta Powers talks about the challenges they are likely to encounter in the court system. 7:35–TV9 Meteorologist Justin Gehrts says temperatures will be sliding throughout the week, and there may be some snow flying before it’s over. 7:50–Into the home stretch for Lent, Hy-Vee dietician Tracey Sauke returns to share a few more ideas for meatless meals. 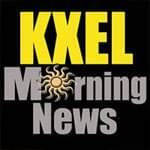 Plus the weather every 10 minutes, 50 percent more news than before, agribusiness information at :15 past each hour, and sports at :30 past each hour…a great way to start the day…the KXEL Morning News with Tim Harwood, Jeff Stein, and Mark Morris, Monday between 5 and 8 a.m. on News/Talk 1540 KXEL.